We're here to help you teach statistics, not software. JMP is powerful statistical analysis and discovery software available for both the mac and windows desktop. JMP includes comprehensive analytic capabilities for every professor, researcher, and student. Have 60 seconds? Watch now. At JMP Academic we’re working hard to create teaching and learning resources to help your students learn JMP quickly and easily. Using JMP in your course doesn’t just help students learn statistics, JMP helps you when you need to assess what they’ve learned. JMP is more than just statistical analysis software, JMP is software that helps students learn about foundational concepts in statistics. JMP empowers students to get the most out of your statistics course, both in learning the concepts in the classroom, and then by applying those concepts in their careers. No matter how your class is taught there is an easy and affordable way for your students to get access to JMP. 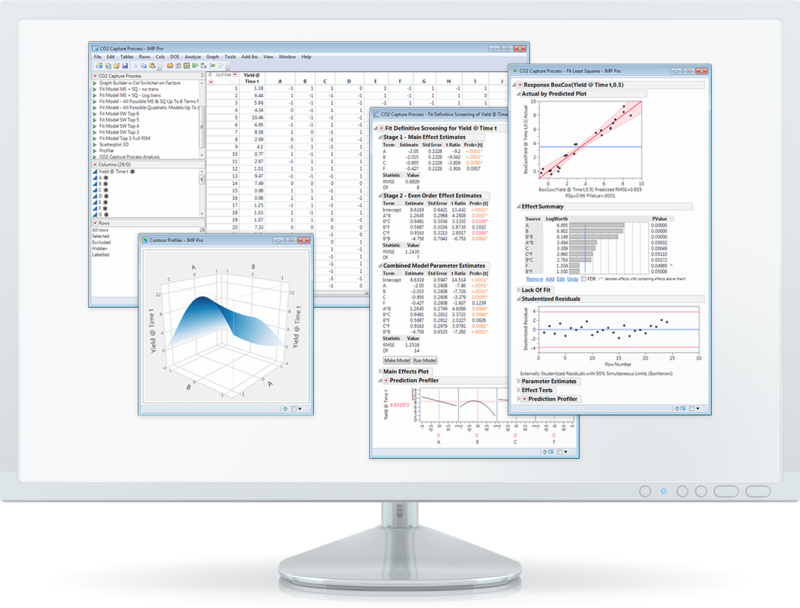 JMP is desktop statistical software from SAS, the leader in business analytics software and services. JMP runs natively on Mac and Windows, combining interactive graphics with comprehensive statistics, data analysis and modeling tools. JMP’s highly visual, point-and-click interface helps students quickly grasp statistical concepts. JMP is also ideal for teaching, allowing professors to spend more time teaching statistics and data analysis and less time teaching software. JMP is more than just statistical software. With its visual and dynamic interface, JMP allows students to explore core statistical concepts, helping them form a strong statistical foundation. Interactive simulations and randomization tests let students engage with the central limit theorem and the conceptual framework behind confidence intervals, hypothesis testing, ANOVA and regression. Built-in tools allow students to explore p-values, statistical power, and statistical models. With JMP, you can easily manage, analyze, and summarize course assessment data. JMP is a proud partner of WebAssign, a leading provider of online assessment tools used by hundreds of colleges and universities. JMP offers a variety materials to help students learn core statistical concepts in the context of real-world problems. and by hundreds of thousands of users in a wide variety of industries. Students develop a résumé skill sought out by employers worldwide. Students gain experience in solving real-world problems by applying the tools and methods used by professionals. With affordable licensing options to fit every situation, it’s never been easier to get JMP.